Cats are majestic but strange beasts; one minute they’re cool and aloof, and the next minute they’re climbing all over your head for mysterious reasons known only to them. Cats do not have time for your human nonsense, so earning their attention and affection is a precious gift. The best way to garner the attention of your cat is to spoil them offerings of food and toys, like these three PAW-some pet gift baskets! 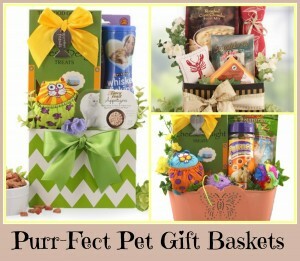 This delightful pet gift basket has all you need to thoroughly spoil your special kitty. This adorable basket features a Zoom Stuffers Fat Cat Catnip Toy, an engraved collar tag in the shape of a fish, gourmet cat treats, and Fancy Feast appetizers. Your kitty will be purring all day! This basket has a little something for you, too! This basket includes soup mix, Wisconsin cheddar cheese, a decorate dish towel, and a seasonal drink selection for you, and a lobster catnip toy for fluffy! Plus, you know they’ll be perfectly happy just hanging out in the box after you empty it out. The ultimate gift basket for your spoiled feline, this basket is bursting with fun! This one-of-a-kind pet gift basket features several toys, gourmet treats, a special engraved collar tag in the shape of a fish, and a cute butterfly tin that you know they’ll want to sleep in! You can’t go wrong with an adorable cat gift basket from Bisket Baskets! Keep your kitty purring with our brand new selection of pet gift baskets for cats! Christmas Gifts for Dogs and Their People! Best Buddies Dog Lover Gift Basket – Our most popular pet lover holiday gift basket with good reason! This attractive treat is packed with plenty of goodness for dogs and their owners. While humans can happily snack away on butter toffee cashews, a hand decorated cookie, Colorado Kernels caramel corn and more, their best bud will be too busy to beg for a bite as they’ll be oh-so-preoccupied with Barkaroo Bakery gourmet dog biscuits and hand iced biscuits. Nothing but the best! The high quality basket makes a perfect place to stow away dog treats on the counter year-round, keeping them at your fingertips but out of paws’ reach. Pizza Pals Dog Lover Gift Basket – I can’t say with certainty that everyone who loves dogs also loves pizza, but I can say I certainly do! And every time I come home with a piping hot pizza pie, my dog just about loses her mind in anticipation of sneaking a bite. 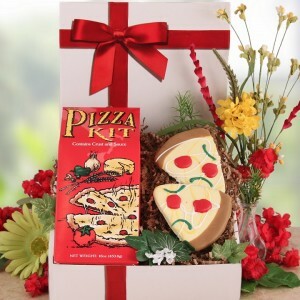 Our Pizza Pals set makes a perfect Christmas gift basket for dog lovers for a few reasons, not the least of which is that the contents are red and green. But that’s not the most important part, of course – flavor is more important than color, and this delivers! Inside each you’ll find a pizza kit that includes crust and sauce, as well as adorable pizza shaped dog biscuits. After a long day at work or shopping, pet owners are sure to appreciate having this easy kit at hand to whip up a quick dinner. And while they’re savoring every slice, their favorite furry friend will be at their feet enjoying hand iced pizza treats of their own. There aren’t too many things better in life than relaxing with yummy pizza and a happy dog! Christmas Gift Baskets for Families – Something for Everyone! The holiday season brings with it many wonderful things: spending more quality time with family and friends, that first white blanket of snow on a frosty morning, more cups of cocoa than you can count, and some of the most memorable, feel-good songs you can imagine. But it also brings with it some very stretched purse strings! There are snow tires to buy, winter coats to have dry cleaned, heating bills to be paid, and of course, presents to buy. As our Christmas shopping lists only seem to grow with each passing year, and our desire to share in the spirit of giving with loved ones grows along with them, for many of us the time has come for a change in the way we shop. There are many ways to help keep your holiday shopping budget in check, and here we’ll be offering up one of our favorites – Christmas Gift Baskets for Families! 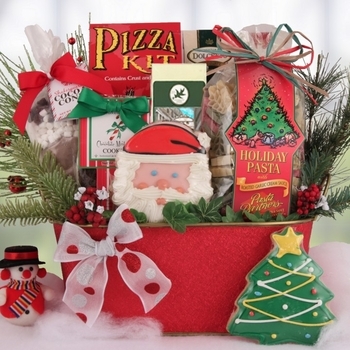 Many of the Christmas gift baskets at BisketBaskets.com were designed with families in mind. These presents are packed full of indulgences everyone can enjoy, from your best friend to her husband and their kiddos. Rather than buying separate gifts for everyone on your list, opting for a group gift whenever possible can help you give something truly useful and attractive while still being able to keep the heat on in your house! You can also choose to give the gifts with someone else or several people. If you and others will be buying a Christmas gift for the same person and you know they’re looking to keep costs down this year as well, invite them over for coffee and browse our Christmas gift baskets for families together. Not only will you get some quality time in, but you’ll get some names crossed off your shopping list without ever having to leave the house! Looking for the best place to start? Consider our meal gift baskets, packed with all the necessary ingredients for a memorable breakfast, lunch, dinner or snacking session. Gifting a couple who enjoys a glass of wine from time to time? Our wine gifts start at just $24.99! Know a family who would much rather spoil their precious pet for the holidays than themselves? Our Christmas gifts for dogs and Christmas gifts for pet lovers selection offers options that are sure to earn two paws up! If it’s sweet treats you’re after, you’ll also find plenty of cookie and candy gifts in our Christmas gift baskets collection. We hope you’ll find that saving money with a family or group gift is the right choice for you to spread just as much holiday cheer as ever without sacrificing an ounce of seasonal spirit. After all – Christmas bells are always better than Christmas bills! Three Dog Lovers Gift Ideas To Guarantee Smiles And Tail Wags! We (and our dogs!) couldn’t agree more with the quote, attributed to Susan Ariel Rainbow Kennedy, “Dogs are miracles with paws.” If you have a dog yourself, or a friend, family member, or colleague or client has a dog, they likely have photos of their darling dog around, or mention Baxter in conversation. When it comes time to gift shopping, even if it’s a simple thank you gift, you’re going to be thinking hard about their interests. If their dog pops into your mind, well, you’ve got it made! We know you’re short on time, and running out to the mall, selecting the right gift, going home, wrapping it, and writing a card out doesn’t exactly fit into your schedule well. That’s why we’re here – we were one of the first companies to create and offer Dog Gift Baskets, and we’ve only enhanced our Baxter-approved gift baskets since then. It’s a cute way to show the dog’s owner that you appreciate them – and are listening to them, too! Visit your local gift store and pick up a dog-themed photo frame. If you can find a photo of the dog owner with their dog, perhaps on Facebook, print it out, place it in the frame, and wrap the frame in tissue paper. No need to fret if you don’t have a photo – the dog-themed photo frame is certainly thoughtful too, and they’ll appreciate that you have paid attention to their interests! Are you able to splurge a bit more? Think of this gift as a “two-parter” – a spa gift certificate for the dog owner, and a gift certificate for Baxter to a local dog grooming spa. It’s a cute way to help both dog owner and dog relax and enjoy some pampering! One of the keys to successful gifting is choosing a gift that really means something to the recipient – a gift that embraces their interests or reflects their personality. If they’re over the moon about their pooch, a Dog Gift Basket is a great way to show them you’re paying attention and care about what they care about, too! Tips To Keep Baxter Barking Happily Away As The Temps Heat Up! Take note of how long your dog is outside. If you’re lucky enough to have a yard your dog can safely run around in, it’s nice to let your dog outside in the summer and just let him or her enjoy the warm weather and exercise! Yet, most dogs have trouble calling it quits, even if they’re panting and breathing hard in the hot weather. Limit your dog’s running time to fifteen minute increments. Lifeguard on duty. Most dogs love to swim in the summertime and are natural swimmers, but any dog can get scared in suddenly deep waters or be taken with a wave or the current of a river. Pet stores do sell life jackets for dogs, and it’s vital that you only allow your dog to swim in shallow, calm water. Preventative safety and supervision is key to happy canine swimming. Keep the water bowl filled! Fido can’t exactly tell you when he needs water, so it’s our duty as loving dog owners to ensure his water bowl always has H20 in it. If you’re traveling and bringing him along, be sure to pack a water bottle and portable bowl to bring along with you. Hot cars, stuffy houses, and dogs don’t mix. Just as you know not to leave your dog in a hot car for any amount of time, the same goes for your home in the summertime. If you leave Baxter home while you’re at work, imagine how hot your house can get as the sun beats her rays down on it. You wouldn’t be comfortable in it, and neither will your dog. Position fans around your home, and turn your air conditioner’s energy saver function on to keep your pooch cool! Keep critters out of your dog’s fur. We all know how important it is to search our dog’s coat for fleas and ticks every time our dog comes in from outside, but there’s also the risk of beetles, spiders, and flies. Sure, they may not harm your dog like a flea or tick can, but having a critter in your coat doesn’t exactly feel great for your dog, and you certainly don’t want bugs inside your home. Take a few minutes to “pet” (examine) your dog when he or she comes in from outside. The way to a hostess’s heart is through her dog. The holidays feel like the busiest time of the year, but summer is a close second. You’re going to cookouts and parties almost every weekend, and you want to bring something more interesting than another dip or dessert. Good dogs deserve healthy treats, so gift the host or hostess with dog gift baskets for their pooch! They’re filled with healthy goodies and toys for Fido, making his summer a fun one, and gifting the hostess with a very memorable gift. The sunny days and blue skies make the summer season a favorite for us, especially out here in beautiful Colorado. By keeping an eye on the amount of time Baxter is outside, and following summer dog care tips, we can make sure we’ll have a summer that’s filled with only sun and laughter! 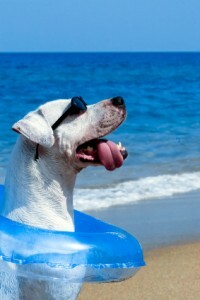 Feel free to share your own summer dog care tips by leaving a comment! Is Your Canine Sick As A Dog? Here’s How To Give Your Dog His Medicine! Ever heard the expression “sick as a dog”? Dogs will eat and get into just about anything, resulting in a sick pooch here and there! Just like you, your dog may feel a little blue from time to time, and if you notice a change in your pet’s behavior or appearance, such as your dog feeling sluggish or having skin irritations, a visit to the vet is certainly due. Your vet will likely prescribe your dog medication in a tablet or pill form, and well, your dog may not exactly love taking that pill! We’ve been around dogs our whole lives and were one of the first companies to debut Pet Gift Baskets filled with healthy treats to lift the spirits of sick pets, and we’re here to give you our tried and true pet medicine experience! Step 1: It’s important to first calm your dog. We suggest working in pairs, with one person giving your dog medication, and the other calmly stroking your dog’s coat throughout the process. Be sure to have your dog sit. Step 2: Using two fingers, hold your dog’s mouth from above his upper lip. Step 3: Tilt your dog’s head back. Unfortunately, your dog’s lower jaw usually does not open enough to just stick the pill in your dog’s mouth at this point. Step 4: Your dog will want to close his mouth, so take care to fold your dog’s upper lip over his teeth. This way, if he should bite down, he’ll be biting his lip, and not your fingers! Step 5: Securely hold your dog’s lower jaw with your thumb and finger and open your dog’s mouth, using another finger to drop the pill as far back inside your dog’s mouth as possible. Step 6: Close your dog’s mouth and gently blow on your dog’s nose to encourage him to swallow the pillow. Step 7: Once your dog has swallowed, be sure to reward your dog for a job well done! The healthy and delectable treats in our Dog Gift Baskets are perfect for rewarding Fido for working with you to get him on the path to good health once again. Giving your dog medication isn’t the easiest process, but it does get easier as your pooch gets more comfortable with it. Many of our dog gift baskets come with Greenies Pill Pockets Treats inside – they come in several different dog-friendly flavors, and you simply stick your dog’s tablets inside them. The Pill Pocket treat tastes delicious to your pup, so he just woofs it down like any other treat! Have a sick pooch of your own, or have a friend, family member, or client with an under-the-weather canine? Dogs are just like members of our families, so sending a dog gift basket, such as our Back On Your Paws Dog Gift Basket, or one of our Pet Lover Gift Baskets that includes goodies for both pet and owner, is a great way to show that you care about them and what means so much to them – their dog. 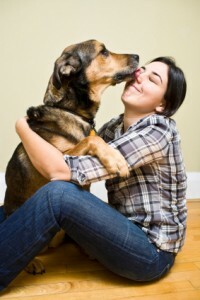 What are your tried and true tips for giving your dog his medication? 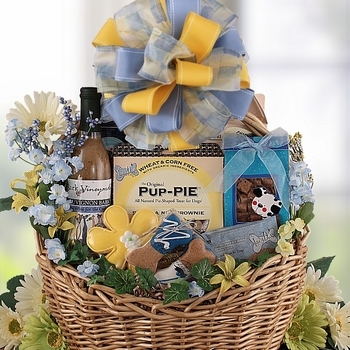 Celebrate National Dog Week with Dog Gift Baskets and More! 1.) Spend extra time going for walks with your pooch. Walking isn’t just great exercise for you both, but it’s also tons of fun! 2.) Make sure that you keep up with your dog’s regular vet appointments. We all know that things get busy and schedules get hectic, but you should never let your dog’s health fall by the wayside. Keep your dog happy and healthy! 3.) Try to spend at least a 1/2 hour every day playing with your dog. Break out the toys, wrestle, or play fetch in the yard – it’s all up to you! 4.) Give your pup an extra belly rub…or two…or five. You know he deserves it! 5.) Bake your pup some homemade dog treats. It’ll be a great weekend activity and most dog treat recipes are super simple and fast! Then, you’ll have something truly special and made with love to give to your pup during this special week. 6.) Get your dog groomed. He’ll look his best, feel his best, and it’s a way to give your dog a lil’ extra pampering! 7.) Give your dog a gift basket! At BisketBaskets.com, we have a great selection of dog gift baskets that are perfect for gifting during National Dog Week. Choose the one that’s best for your dog! 8.) Have friends that love dogs just as much as you do? 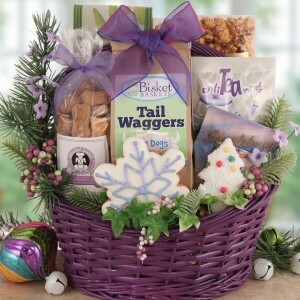 Then send a Pet and Owner Gift Basket from our selection too! It’s a great way to show you care while ensuring that every dog in your life gets a little extra lovin’. 9.) Get your dog a new toy or collar. A gift can always get two paws up from your pup! 10.) Cuddle with your dog! It’ll lift your mood while letting your dog know just how much you care. Plus, there’s nothing more perfect than puppy cuddles! Do you have any other suggestions on how to celebrate National Dog Week? Let us know! We know it’s not easy leaving your dog at home while you go away on vacation or a business trip. Sure, you can have a friend or family member check in regularly, but your dog is alone for the rest of the day, and dogs are of course very social creatures. The Shylo Country Club for Dogs created a place for dogs to have fun while you’re having fun on vacation, too! Located in Aurora, Colorado, the same great state we’re proud to live in, Shylo Country Club For Dogs boasts impressive Facilities, with 12 different play yards, including two separate play areas with one just for puppies and one just for the senior dogs. They even have a swimming pool for dogs! Your dog will be spending much of his or her time playing outside, rather than cooped up inside in a kennel. They feature a great array of Dog Boarding Services, and we hope you’ll check them out! It’s so refreshing to see such a novel approach to dog boarding! Where is your favorite spring break travel destination? Now is the time of school spring breaks and many of us are traveling the country and some even the world looking for that special relaxing location that lets us get away from it all. White sandy beaches in the Caribbean with temperatures in the upper 80’s are just what the doctor ordered after a long cold winter; while for others it’s that last trip to the Rockies to get in some final skiing of the season. With BisketBaskets.com being located just outside of Denver Colorado, we know all about the latter! We are always bathed in bright warm sunshine here but the snow seems to not want to let go in April either so among beautiful 70’s and 80’s we get that gentle reminder that it’s not summer yet with a fresh coating of white snow every now and then. Many of us hit the condos and hotels directly on the ocean or tucked away in the mountains while still others are fortunate to have family and friends in all the right locations! Be sure you let them know just how much you appreciate their hospitality by sending them a very delicious thank you gift basket. We send a lot of thank you gifts during the spring break season to thank people for sharing their home and putting up with them for the week’s break but we send even more to the family dog and cat that have shared their backyard or litter box! So if you’re wondering what would be a great thank you for your hospitality gift; look no further as we have a vast assortment of thank you gifts that would be perfect for recipients of any age. We offer sweet candy bouquets made with only the most awesome candy like Reese’s Peanut Butter Cups or M&M’s and even Skittles or how about a festive cookie bouquet or pet gift baskets along with the traditional gourmet food gift baskets that everyone just loves! 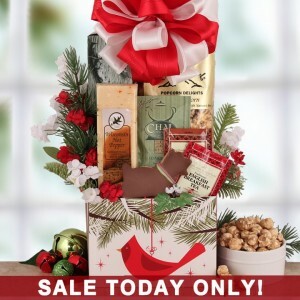 You can select from chocolate gifts, tea baskets, soup baskets, wine themed gift baskets and so much more. Drop on by and take a look at what we can send to that great bunch of people you just shared their place with. We ship throughout the USA and Canada so there is no need to leave anyone out and our ground shipping delivers to about 75% of the USA in just 3 business days! Say THANK YOU today and let us know your favorite spring travel destination!